Central repository and tools to manage mailing jobs. MailCentral™ is a customer service oriented mail outsourcing toolset that empowers users to obtain effective control and management of outsourced mailings. MailCentral™ operates as a module integrated within all Progressive products. In addition MailCentral™ enables 3rd party billing systems to also automate their out-sourcing of mail services. MailCentral™ employs an easy to use point and click graphical interface for quick review of all mailings and supporting documents. Optionally designate PDF documents for insertion into envelopes in addition to the primary documents. 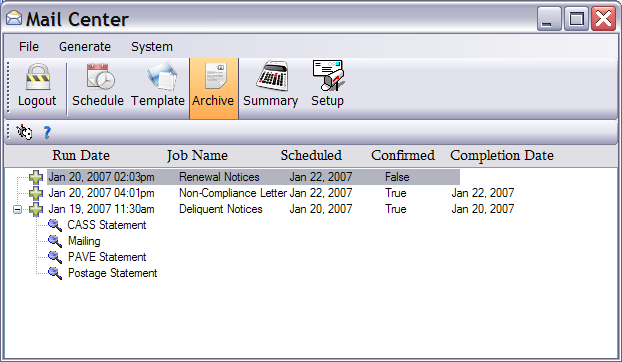 Create and manage mailings from both PSI and 3rd party applications. Optionally transfer data to PSI for Electronic Bill Presentment and Payment (EBPP). Transmit mailing files via the internet for processing. Receive confirmation of transmission receipt and anticipated processing date. Receive confirmation of delivery to USPS and an electronic copy of the PAVE and Postal Statements. Remotely monitor transactions and statuses from anywhere you have internet access. Specify date ranges for report generation of detail for all mailings (and costs) and summarize the costs for the specified period.